Warriors of the Wind is an expansion for Legend of the Five Rings: The Card Game primarily featuring the Unicorn Clan. This pack contains 78 new cards (3 copies each of 25 different cards and 1 copy each of 3 different cards) designed to augment existing decks. Set in the mythical world of Rokugan, Legend of the Five Rings is a game of strategic battles and court intrigue in which players struggle for honour and glory. 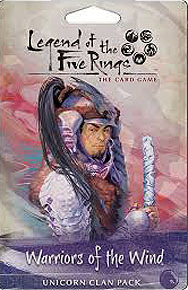 Legend of the Five Rings: The Card Game core set is required to play.